Gluten free breakfasts are easier than the sound of it. 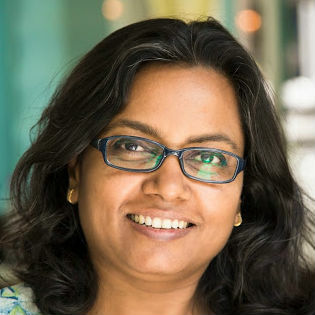 There are many ingredients that would surprise you about the variety you can afford to have once you ditch that toast or paratha for breakfast. 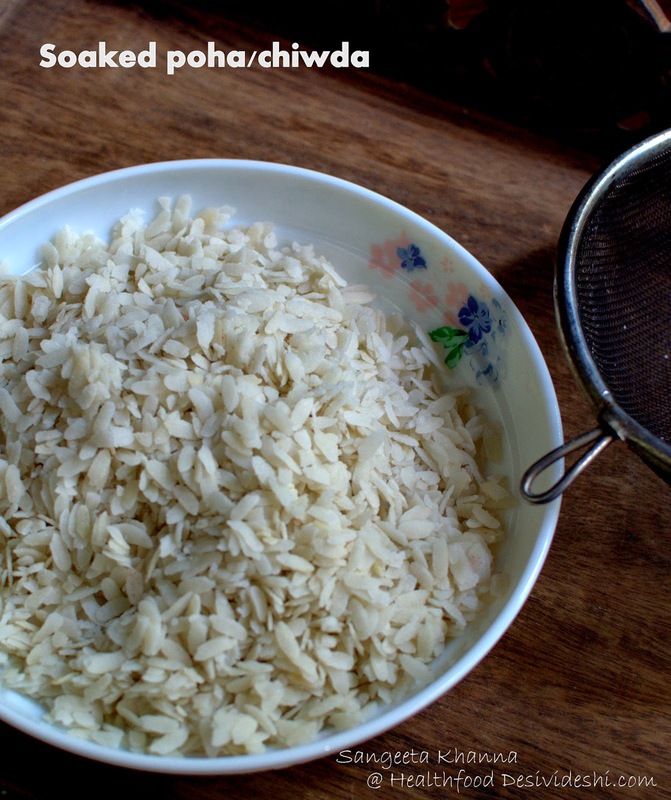 I have written about how poha (beaten or flattened rice) is a probiotic and prebiotic food, a good quality ready to eat cereal that can be used in so many different ways that no packaged cereal can beat this. Poha can make sweet breakfasts with yogurt and fruit, smoothies with poha and it makes the popular savoury breakfast called pohe with a prefix of onion, potato or peas whatever you add to it. Kande pohe, batata poha and dadpe pohe all are different ways to relish this native cereal produced and used all over India in some form or the other. My experiments have resulted in some yummy concoctions like poha with mango and coconut. But there are a few versions I am yet to share. Bringing some of them in this post, hopefully you would also like them as much as I do. Rinse the poha under tap water keeping it in a sieve. Keep aside. Heat the ghee in a wide pan and tip in the cumin seeds. Let the cumin crackle and add the green chillies and ginger, followed by green peas and salt. Mix and cook covered for 5 minutes or till cooked. Now add the crumbled paneer and stir fry for a few seconds or till the paneer heats up and soaks in the flavours. Add the drained poha, lime juice and pepper powder, mix well and cook covered on very low flame for 2-3 minutes or till the poha warms up thoroughly. Sprinkle chopped coriander greens and serve hot. We like having ginger tea with this kind of breakfast. Rinse the poha under running water, keeping them in a deep sieve. Keep aside to drain. Heat the ghee in a wide thick base pan and tip in the cumin, fennel and mustard seeds. Wait till they all crackle and then add the chopped onions, curry leaves and potatoes. Add salt, turmeric powder, green chillies and stir fry on medium flame till done. You can cover the pan to quicken the cooking process. It takes about 5 minutes for this quantity. Now add the soaked poha, chopped coriander greens and pepper powder mix well and cover and cook for 3-4 minutes on very low flame. Take the pan off the flame and add the lime juice to taste, adjust seasoning and serve in bowls. 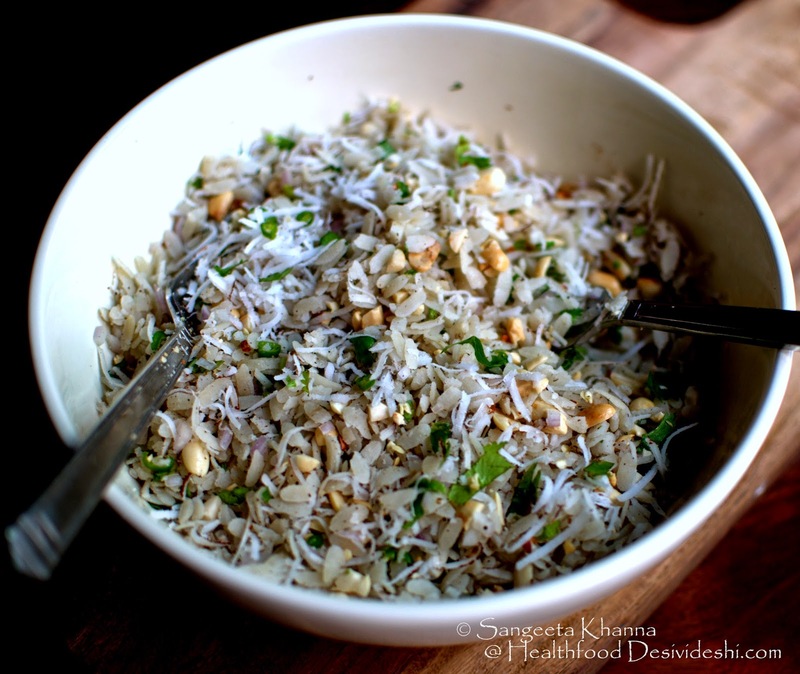 Sprinkle grated coconut and roasted peanuts on top and serve immediately. 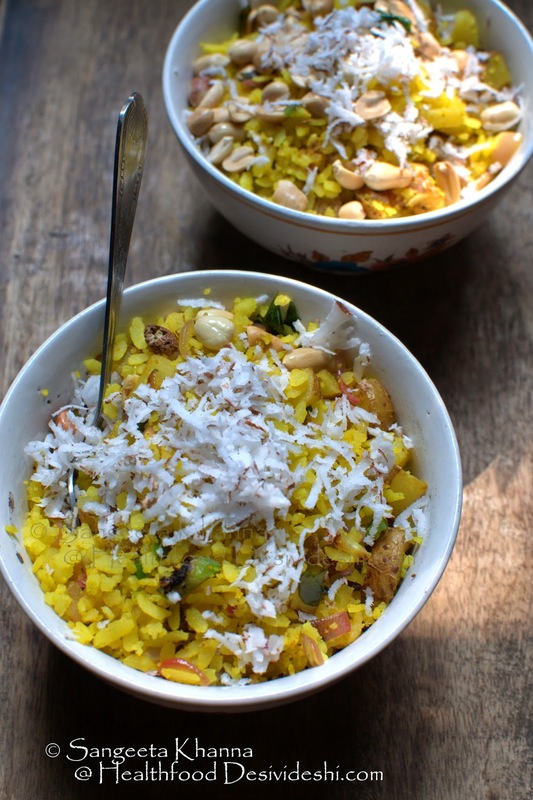 This dadpe pohe recipe is a Maharashtra special (most poha recipes originated there btw) and doesn't involve cooking and is preferably made with tender coconut water as well as tender coconut meat. But one can make it using regular coconut milk and fresh grated coconut too. Being uncooked poha this recipe provides the best probiotic benefit. This recipe uses freshly grated coconut and packaged coconut milk. If using tender coconut water one can skip rinsing the poha and soak them in the coconut water itself for better flavours. Rinse the poha under running water and drain completely. The poha looks like this after rinsing and letting them soak for 5 minutes. Now add the other ingredients except peanuts, mix well in a bowl and press with a small plate to cover the poha mix and keep a heavy bowl over this. Pressing the poha is done to allow the poha to soak all the flavours. I find 30 minutes of pressing enough to soak up the flavours but it depends on the type of poha being used. Normally when one cooks poha the heating makes the flavours seep in easily. For this raw preparation this pressing method is very important. 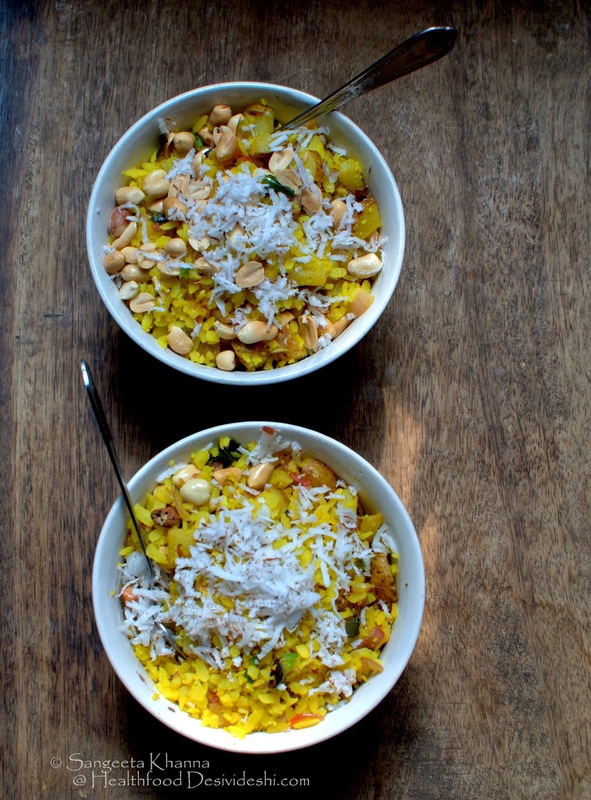 Serve cold (at room temperature) topped with a little more grated coconut or peanuts. 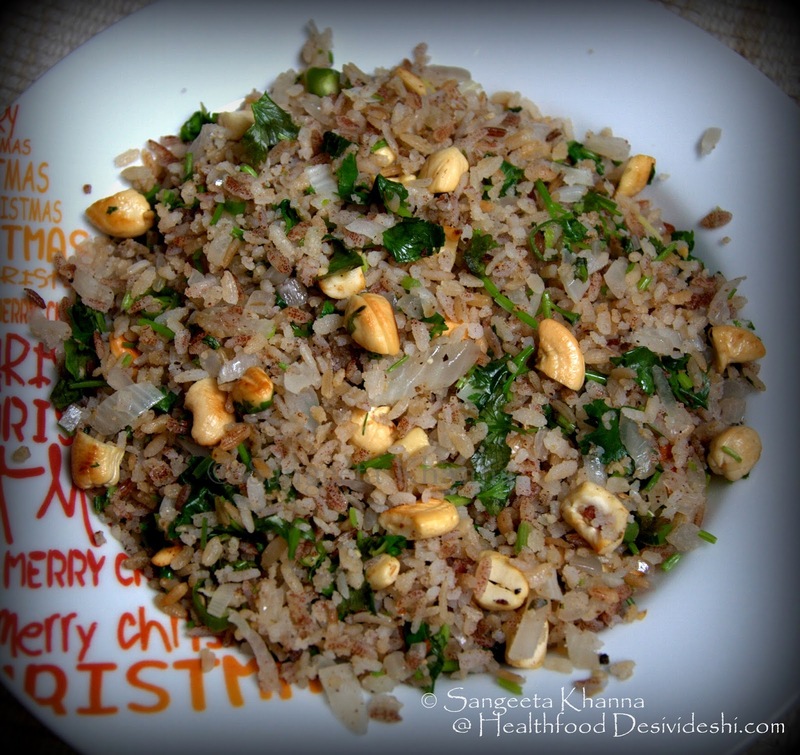 The husband loves roasted peanuts but I skip adding them if it is a flavourful dadpe pohe. 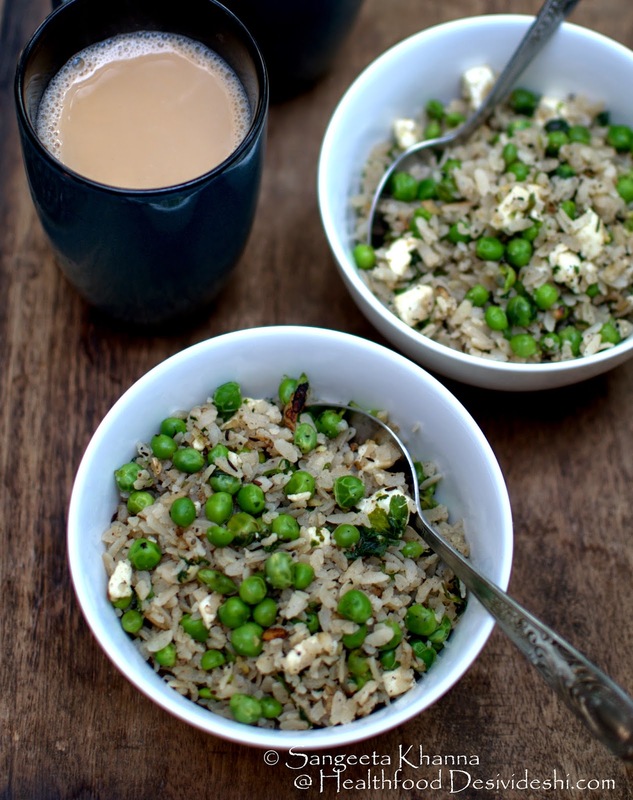 This dadpe pohe might not be the best poha recipe for winter months but in summers this recipe is such a refreshing breakfast that we like to make it quite often. No cook recipe get repeated for other reasons too. Convenience doesn't mean eating instant noodles. This is another instant recipe that involves just mixing the ingredients and microwaving all of them together for 2-3 minutes per serving. 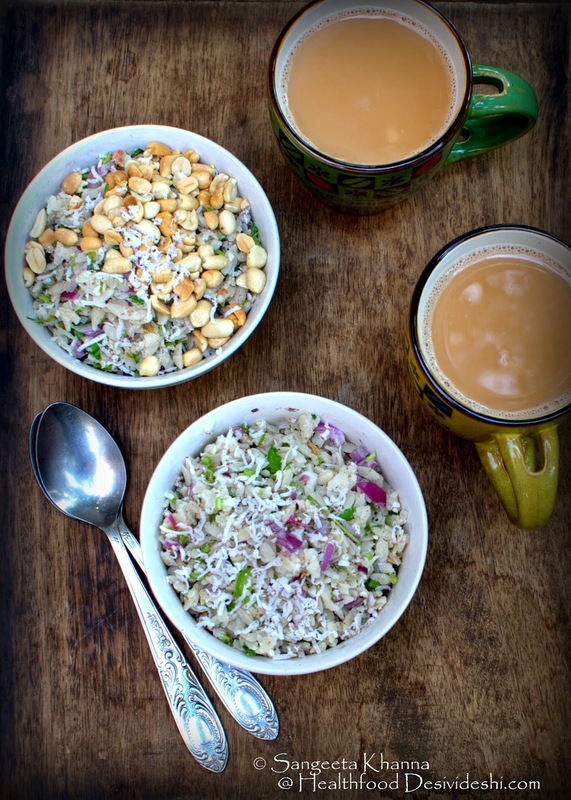 This poha recipe gives instant noodles a run for their money. Rinse the poha just like the above recipes. Mix all the ingredients in a microwave safe bowl and microwave (covered with a loose lid) for 2 minutes. Stir well and microwave again for 2 minutes or till a cooked aroma of coriander greens and fresh poha with a whiff of ghee is noticeable. Serve hot and see how you like it so much better than any instant noodles. I add the dry garlic chutney to this poha sometimes to add more flavours but the south Indian gunpowder also works great. Sprinkle it after serving it on your plate and see how you can make it even more hot and tangy. And here is a microwave cooked poha topped with fried cashews. This poha is made using the red poha we sometimes get in north east states of India or even in Maharashtra. Thanks to our travels and the tendency to shop for such ingredients, we end up tasting a lot of things that we don't get where we live. 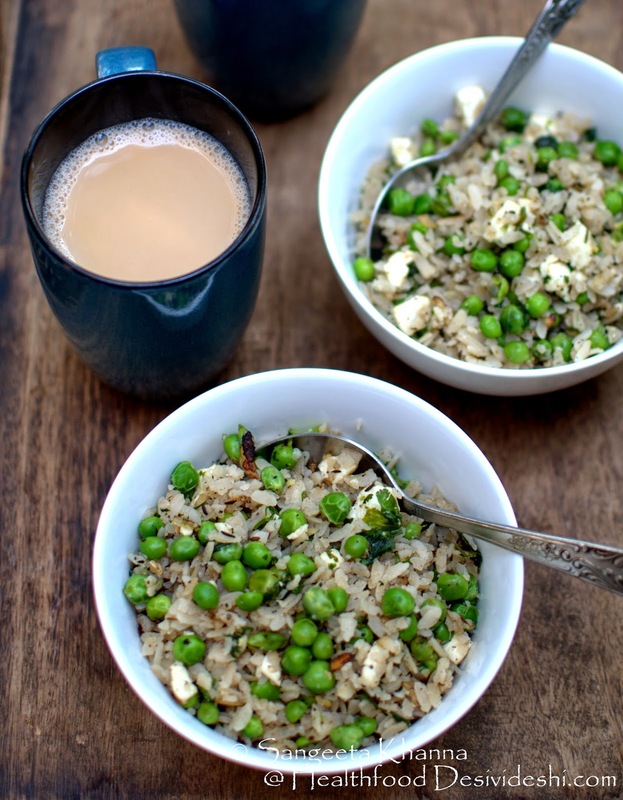 Now with so many ideas with breakfast poha, gluten free breakfast will not be boring at all. I do eat wheat but minimal use of gluten is what I aim for as I feel lighter whenever I eat gluten free food. Thank God there are so many options of gluten free foods to choose from in Indian cuisine. I am posting these recipes of gluten free breakfast for all those people who are dependent on breads and parathas for breakfast and complaint that this kind f breakfast is filling and satisfying but it makes them slugging after an hour. Try having a plateful of poha and see how it makes you feel different. PS : these recipes make 2 really large servings. 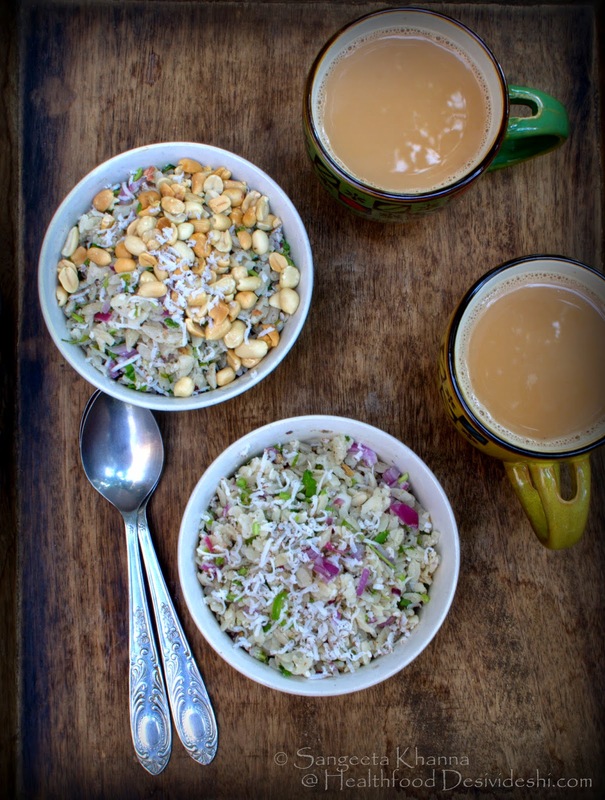 We generally have a large breakfast when we plan a salad meal for lunch but all these poha recipe can be really light if one serves them in smaller portions that suits well for a tea time snack. delicious and tempting poha recipes.